The following is an email correspondence from December 2018 between a Krishna devotee and an associate of the United Lodge of Theosophists. Hare Krishna Devotee: I read just now about the Theosophical view of God. I find it peculiar that you do not accept a personal God; the Bhagavad Gita seems to promote the adoration or Bhakti of a personal God, Krishna, who for the Christians is the Christ. It’s difficult to not admit that this is true. Prabhupada, the guru of the Hare Krishna movement, made a big battle against the impersonal vision of God due to the fact that it results in atheism. What do you think about Prabhupada? Student of Theosophy: If taken literally, the Bhagavad Gita does indeed seem to be referring to a personal God. But the Theosophical view is that no genuinely inspired scripture is intended to be taken on a plain literalistic material level of understanding. Theosophists view Krishna in the Bhagavad Gita as representing the Higher Self – the Atman – of everyone, and Arjuna as representing the reincarnating individual soul. Thus we are each both Arjuna and Krishna. And if the soul will heed the words and guidance and inspiration from the spirit, it will achieve the goal of Yoga. For a Theosophist familiar with the facts and details about Prabhupada and the Hare Krishna movement it would be extremely difficult to have a positive view of them so it’s probably best we don’t go into that, as it seems we would only disagree. In the Western world, the situation is just the opposite: the Christian belief in a personal God has been the cause (not the cure) of atheism for millions upon millions of people, as they instinctively realise that a personal God does not make philosophical, logical, or reasonable, sense, whereas an impersonal Divine Principle stands up to all the tests of philosophy and logic. We have known numerous people who were raised as Christians, became atheists, and then when they encountered the idea of an impersonal Divine Principle they stopped being atheists and began to take spirituality seriously. Everyone who believes that there is a Divine is either a non-dualist (i.e. the Advaita approach), a semi-dualist (i.e. the Vishishtadvaita approach), or a dualist (i.e. the Dvaita approach). Any believer in Deity cannot help but fall into one of those three categories, since these are ultimately the only three ways of viewing and relating to the Divine. As you no doubt know, the Hare Krishna movement has a Vishishtadvaita approach. Theosophy, on the other hand, takes a purely non-dualistic approach. Although Theosophy is not Hinduism nor Buddhism nor any religion, its approach to the subject of the Divine is very much Advaita style. Theosophy generally does not even use the word “God” because to most people that word conjures up ideas of a personal or anthropomorphic God, a Being, rather than “Be-ness.” Non-dualists, semi-dualists, and dualists, will rarely agree, so it’s probably best that we don’t even bother arguing about these things! Hare Krishna Devotee: I understand your motivations perfectly and I cannot blame you, even though I very much doubt that religious theology leads people to atheism. I believe that it is the non-knowledge of a personal God that leads to atheism. Most people who become atheists are such because they have always been such; if they ever followed religion they did so in a merely traditional and superficial sense and obviously sooner or later they will abandon it. Krishna in the Bhagavad Gita speaks of divine nature and demonic nature and how people who deny God are demons because they are people who want to do as they please. Of course religious fanaticism is also a form of irreligion. In the Mahabharata it is said that the absence of religion and the excess of religion are the same thing. I’d like to know why you do not like Prabhupada. Please explain it, I do want to know. I consider him a great guru. Of course he takes the Bhagavad Gita literally, saying it is all literal and nothing symbolic, but if it is true that Bhakti – love – is the supreme way, how can one practice it if God does not have a personal form? You are a person and everywhere you turn everything has a personality, so how can God not have it? Surely there is indeed also a law that expresses the cosmic order, but can one love a law? Student of Theosophy: Prabhupada and the Hare Krishna movement generally come across in a very fundamentalist, sectarian, and bigoted way. Details shared by friends who either were or had previously been involved with ISKCON (International Society for Krishna Consciousness) make it come across as very much like a cult. One of those friends we knew before she joined ISKCON and then during her time in ISKCON and then afterwards, when she eventually left it. Her personality and character changed for the worse during the time she was involved with it and she said that the leaders warned her against maintaining our communication because she had mentioned that she had a friend who has numerous Buddhistic ideas and who views the Absolute as an impersonal Principle; they apparently responded by saying that it isn’t wise to communicate with Buddhists or people with Buddhist-type ideas as they may damage the devotee’s faith and love for Krishna. Then she proceeded to say how they told her that Buddha was an “Evil Avatar” of Vishnu, sent to test the faith of the Hindus by teaching false doctrines; those who disbelieved his teachings would be blessed by Vishnu, those who believed them would have to pay a Karmic penalty. It can also readily be seen online that Hare Krishna devotees almost view Adi Shankaracharya as demonic for his Advaita – non-dualistic, impersonal – philosophy, whereas any non-brainwashed person can read the Upanishads for themselves and see that an impersonal Principle is exactly what is clearly being spelt out in almost all the major Upanishads. But it is well known that Prabhupada was only particularly keen on the Isha Upanishad because it is one that lends itself most readily to anthropomorphic interpretations, although there are just as many Hindus who do not read it in that way. Being also aware of some of Prabhupada’s extremely demeaning statements about women, black people, and Jews, not to mention his positivity towards Hitler and Nazism, and his teaching that everyone other than Hare Krishna devotees are atheists – all of which statements are held as divine words of a divine Guru, by ISKCON members – it is impossible to view him in the same way as you do. Sorry to say all this but you can maybe see now the reasons for initially trying to avoid the subject of Prabhupada but as you were insistent . . . It would be wrong, however, to expect you to change your view, so the best we can do is respectfully agree to disagree. The word “if” that you used is particularly important. You’re no doubt aware that not everyone who reads and reveres the Bhagavad Gita arrives at the same conclusion from reading it. Prabhupada and his followers arrived at the conclusion that Bhakti is the supreme way to achieving Yoga, Union with the Divine. But that is not the message that many other people get from reading and studying the same scripture. Incidentally, Prabhupada’s Gita translation – “Bhagavad Gita: As It Is” – is criticised by many for having inaccuracies and mistranslations, which some think are deliberately done in order to make the text more specifically represent his own ultra-Bhakti ultra-anthropomorphic views. What many Hindus and also Theosophists get from the Gita is that Krishna is promoting what some call an “Integral Yoga” or “Yoga of Synthesis,” i.e. the book is divisible into three sections of six chapters each and in the first six he is essentially teaching Karma Yoga, in the next six Bhakti Yoga, and in the last six Jnana Yoga. In other words, action – devotion – knowledge, or the combination and union of hands-heart-head. All of these are needed to really reach the goal and none of them ought to take precedence over the other. Certainly, love and compassion is THE most important thing for anyone, on the spiritual Path, but knowledge, mind, and intellect, are just as important, although they should be informed and guided by love and compassion. But real Bhakti does not necessarily mean singing songs to a man in the sky (ISKCON members have told us that Krishna is literally a big blue man up in the sky) or worshipping a statue or image of an anthropomorphic deity. If one reads the Gita as Krishna representing and speaking as the Higher Self of each of us – which is really Brahman, the Supreme Self, the one Absolute Divine Principle – then one’s Bhakti, one’s spiritual devotion, is for and towards the whole of humanity, for we then see each human being as Brahman, just as we see ourselves as being Brahman in the highermost part of our spiritual nature. In Theosophy we often speak of acting, working, and living, for and as the Self of all Creatures. We are the One Universal Self, both in terms of each individual human being and the whole of collective humanity. This is where our Bhakti and devotion lies, in seeing and honouring the inner Divinity and Godhood of every being, as also within our own being. And this term “Self” is used in Theosophy, as also in the Upanishads and in Advaita Vedanta – and, we would add, in the Bhagavad Gita – as a term for “Essence” or “highermost identity” or “innermost Reality” and not as indicating a Self in the sense of a Person or an individual Being or a “Supreme Personality of the Godhead,” which is very much a contradiction in terms. You asked “can one love a law?” Well, “Law” is not the only way in which we speak of the Absolute. As well as being the One Law it is also the One Life, that infinite LIFE which manifests everywhere and of which everything in manifestation is an expression in some form or another. It is the One Consciousness, the One Supreme Pure Absolute CONSCIOUSNESS Itself, of which our own consciousness is an individualised differentiation. 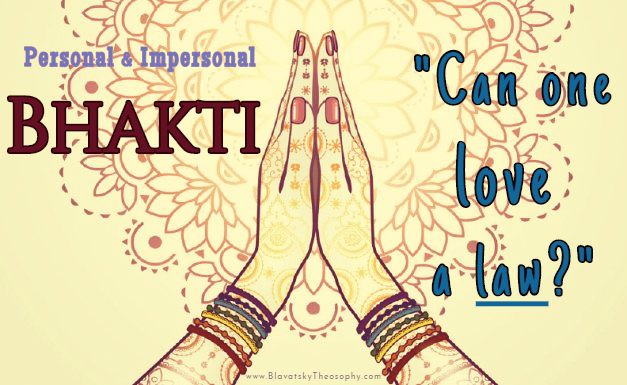 Please feel free to disagree but hopefully these explanations may help to make it clearer why and how it is possible to practice Bhakti even with a thoroughly impersonal conception of the Divine. This is naturally not the same type of Bhakti as that of Prabhupada and ISKCON but it is still Bhakti nonetheless. Hare Krishna Devotee: I will need some time to answer you because I want to reflect well on what you wrote to me. Thanks and best wishes. Note: After six weeks there had still been no further reply. You may also like to read: What Does Theosophy Say About God?, The Impersonal Divine, The “God” Question, The Theosophy of the Bhagavad Gita, The Life & Times of Adi Shankaracharya, 12 Things Theosophy Teaches, Atman – The Higher Self, and Who are you, Madame Blavatsky?